Templates play a central role in the process of setting up and using a production process. They make it possible to not only create content quickly — such as articles or layouts — but also ensure that this content contains the required (and allowed) components and styling for the publication in which that content is used. This article describes how to work with layout templates and Layout Module templates in Smart Connection. Placing content on a layout template or Layout Module template is more limited compared to placing content on regular layouts or Layout Modules. When done, check-in the layout and make sure that the option 'Save as Template' at the bottom of the check-in dialog box is selected. In the Smart Connection panel, double-click the template while holding down the Option key (MacOS) or Alt key (Windows). 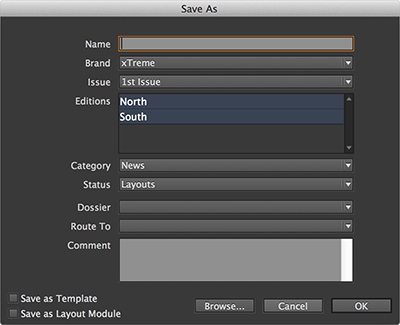 To use a layout template or Layout Module template as a layout, open it by using any of the regular methods. A new layout is created named 'Untitled'. To add it to the Enterprise workflow, use one of the methods for saving it. 3 January 2019: Converted content from PDF to Web-article. 3 January 2019: Renamed from 'Working with layout templates in Smart Connection'.